When you consider integrating HubSpot with WordPress, you are talking about bringing together the most popular content management system with the best inbound marketing methodology which also provides a COS/CMS platform. It is not possible to compare both these platforms as both have been developed with a different perspective. However, marketers could consider integrating the advanced technology in their current online marketing initiatives to add value to their campaigns. Let’s see how the fusion of traditional and contemporary platforms could help you in achieving better results. Adaptation for marketers is a profound process. It is the only factor that helps you thrive in the ever-evolving marketing world. Are you ready for the advanced Hubspot marketing software? Is there anyone in the online marketing industry who wouldn’t love Hubspot for all the power bundled under one single platform? Starting from creating tailored inbound marketing campaign with relevant messages along with customization of templates, to reach the prospects with the right content at the right time, you get everything packed with added value with the Hubspot software. So you want Hubspot and don’t want to bid goodbye to your WordPress platform, huh? Well, you could always go for the partial or the essential migration. This involves some plugins and third party platforms that are available for minimal cost or absolutely free of cost. The main benefit of this integration, apart from the price, is that you will not have to completely adopt Hubspot and setup only what you need. Should businesses and marketers consider full migration? There is one concern for all those who are currently working with WordPress and want the advanced features of Hubspot. Some businesses and marketers will not be comfortable with full migration to Hubspot and simply couldn’t afford to miss some of the features of their current platform. They need not worry as they could have a piece of the cake in their existing platter and have a tummy-full of meal (read marketing campaign). With WordPress, there are standard website pages and blog posts. If you are looking to add more features, you will need to add plugins that will require configuration from back-end. With Hubspot, you get an all-inclusive marketing software that will not only help you in online promotions across search and social, but Hubspot COS/CMS also helps you create or customize templates for website, blogs, email, and landing pages that could be later made live with custom messages. These messages could be based on the life-cycle of your prospects. You wouldn’t be doing a fair job by comparing both these platforms that are developed correctly and deliver exactly what they promise. The difference is not in the content optimization/management system (COS/CMS), but in the marketing strategy. Contact Form 7 (or CF7) is a product of contactus.com. When you add CF7 to WordPress, you get a very powerful form that allows you to integrate more than 20 third party cloud based online marketing software. In less than 10 minutes you can install the plugin, map the CF7 fields, and sync the client submissions to any of the 3rd party email and database applications, including Hubspot. 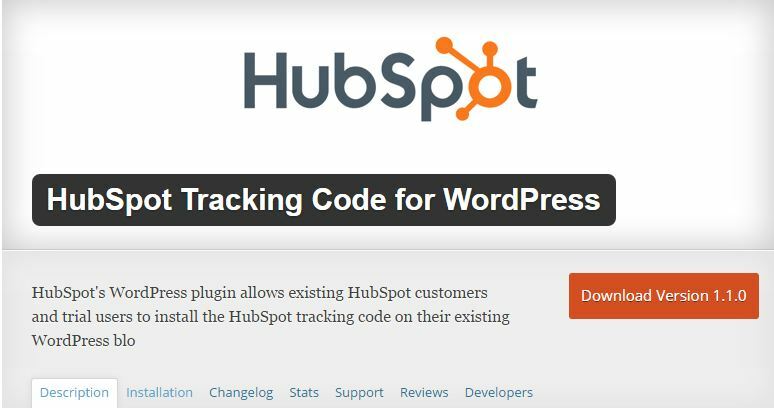 It allows including the Hubspot tracking script into your WordPress blog or website to track visitors. All the elements of the Hubspot dashboard and Hubspot stats are now available from the WordPress site. You automate the publishing process of all the new posts to social media accounts with the help of the Hubspot plugin. This plugin uses the Hubspot lead API so that all the data from the landing pages built with Gravity Forms is sent to Hubspot with all the vital information related to the lead. There is no manual submission needed as Gravity forms’ free add on will feed all the forms directly into Hubspot. It hardly takes a few minutes to setup the plugin and the forms will be linked with HubSpot. The Hubspot Forms plugin provides a platform to embed Hubspot forms wherever you want to enter them on your website. With the help of the visual editor, you will be able to embed forms by selecting a form from the drop-down list. You also get widgets with the plugin and you could insert site-wide forms across any area of the website. If still you have any doubts whether it is Hubspot could be easily integrated with WordPress, the answer is “ABSOLUTELY.” Both these platforms could work together to boost your lead generation campaigns. The integration is low-cost, requires less resources and generates higher returns in terms of conversion.